NUCIG-R Combined cartridge filter + atomiser all in one unit ( cartomiser ). Extra throat, amazing volume 'smoke' / vapor. 1 pack - same as up to 80 ( x 2 ) normal cigarettes. Replacement filters for your NUCIG-R rechargeable kit. 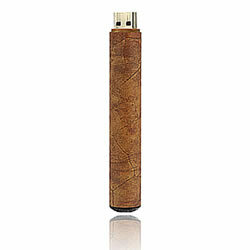 All in one design, simply fit over your electronic cigar battery and use. Average Customer Review: 5 of 5 Total Reviews: 56 Write a review. I quit smoking around 15 years ago but have often had the urge for a cigar again. 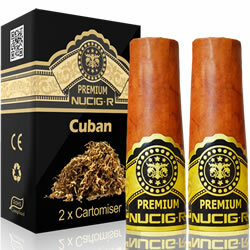 I am absolutely delighted with the Nucig Cuban flavour. I opted for the nicotine free version as I did not crave the hit, just the taste and experience. It works very well with a nice wee dram, Thanks Nucig. Cartridges received in good time, however I have not tried them yet as this was an advance order for when I run out of a competitors cartridges. The flavour of these tips are realistic and full of flavour without being harsh. Website was simple to use and order arrived when promised. Well packed.Good product.